Howard Collier is a 115-acre state nature preserve located in Seneca County in northwestern Ohio. The preserve is named after a former state budget director who was instrumental in allocating funds for the acquisition of park land. The Collier preserve features a loop trail with an impressive staircase/boardwalk that leads down into the flood plain. 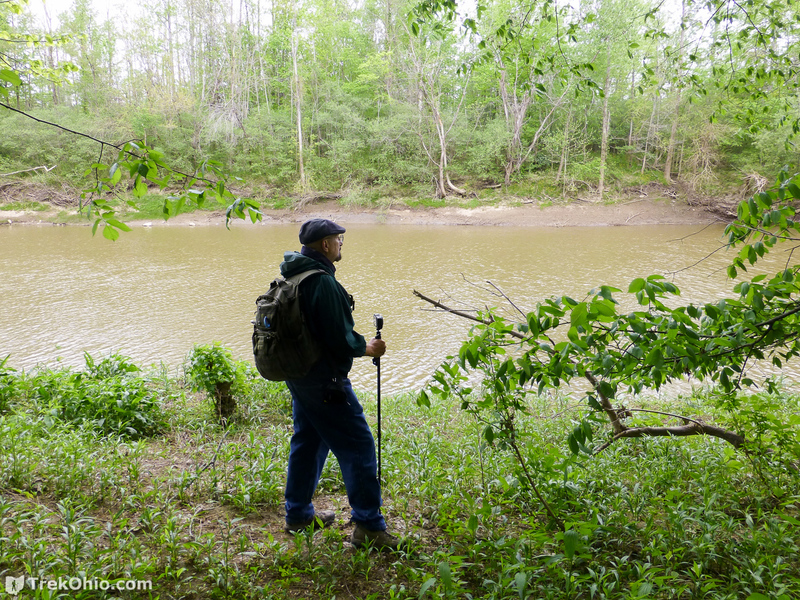 The Sandusky River can be viewed from a couple of short side trails off the loop. 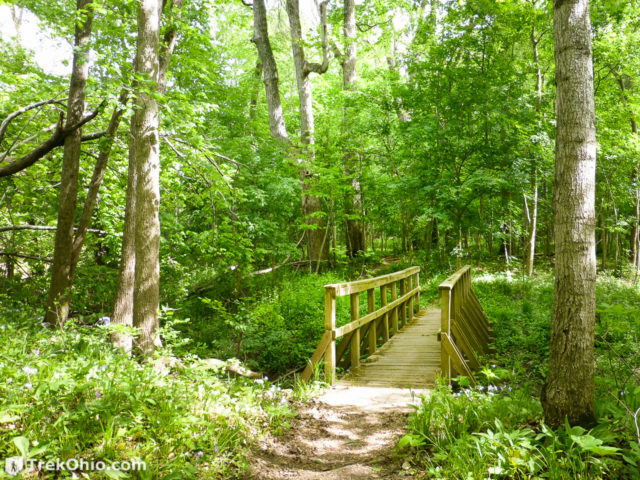 There is also one more extensive side trail that leads to a township road that crosses the Sandusky River at Heck’s Bridge. 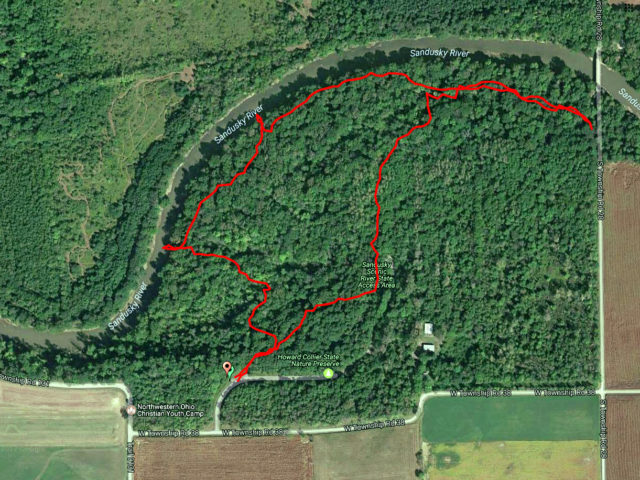 We traced our hike using GPS while visiting the park. The total mileage for our hike was 1.56 miles. 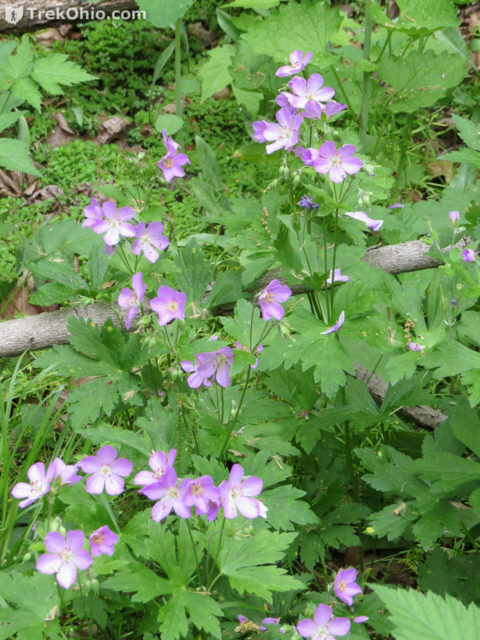 The preserve is a good site for viewing spring wildflowers which are on display in April and May. 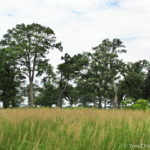 We visited the preserve in mid-May during a previous year. 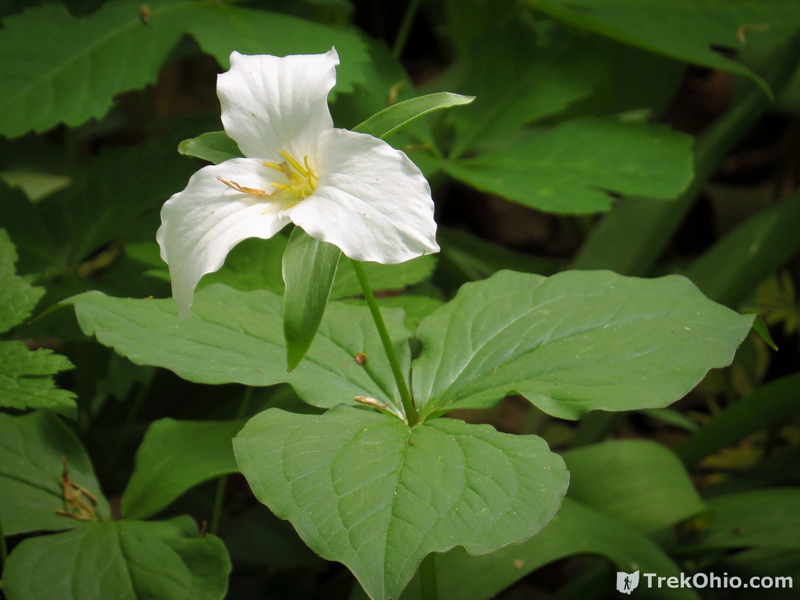 We hiked the loop trail clockwise which I would recommend. This allows you to start your hike by descending a lengthy wooden staircase down to the flood plain adjacent to the Sandusky River. Obviously if you go down you have to come back up again, but the dirt path leading back to the top seems gradual enough that it is not an issue. 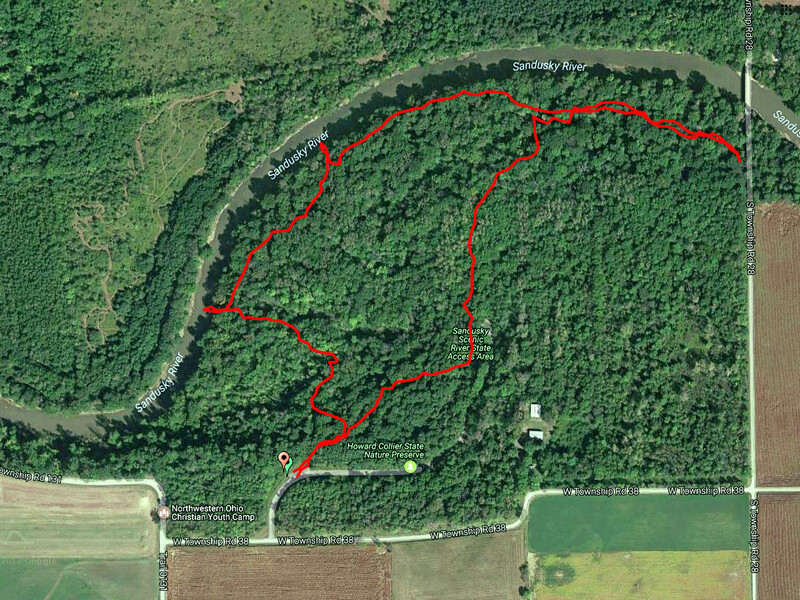 As you can see from the GPS trace below we approached the Sandusky River at two points. There were short dirt paths leading from the loop to the riverbank at these points. 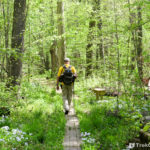 In the northeastern corner of the path, there is the option of leaving the loop and following a dirt trail toward “Heck’s Bridge”. 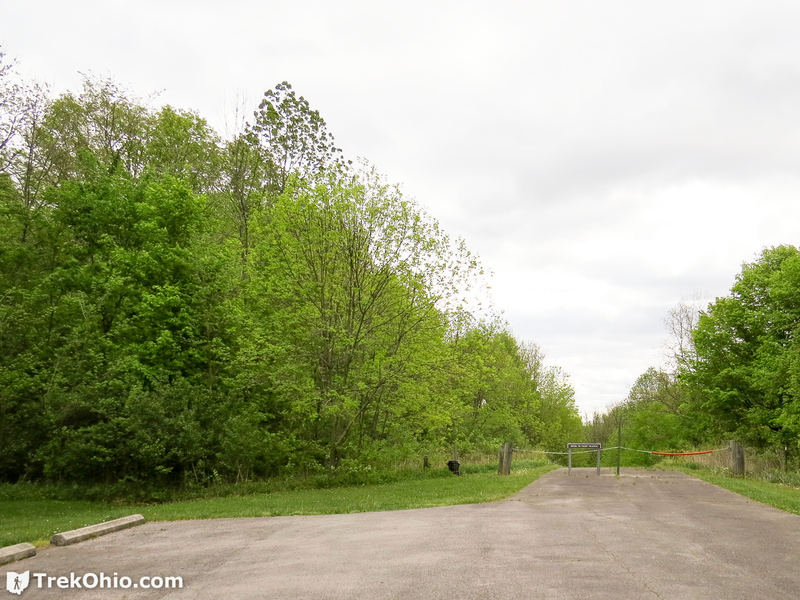 However this side trail dead-ends at S. Township Road 28. If you follow this road to the north, Heck’s Bridge is where S. Township Road 28 crosses the Sandusky River. We could not see the bridge when we reached the end of the trail. The trailhead is easy to locate from the preserve’s parking lot. As you can see below it is located at the corner of the lot. 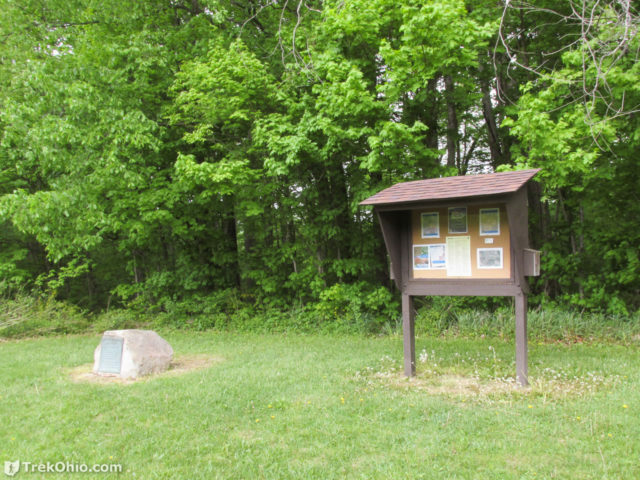 If you look to the left of the trailhead, you’ll see a kiosk and a rock to which a memorial plaque has been mounted. The memorial plaque explains the dedication of the preserve to Howard Collier. The kiosk includes an image showing an aerial view of the preserve. To the right of the trailhead you’ll see that the driveway that brought you into the preserve extends beyond the parking lot, but it is blocked off to vehicular traffic. A sign here explains that it is open to foot traffic. We did not walk down the drive, but while following the loop trail, we had a view of the cul-de-sac where the preserve driveway terminates. 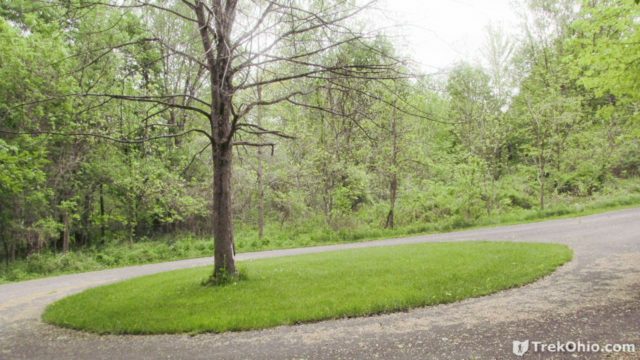 The preserve’s driveway ends in a cul-de-sac that the Loop Trail passes. I’ll start by saying that Bob and I were both blown away by the elaborate and lengthy wooden staircase that leads to the flood plain below. This is the second-most, impressive stairs that we have seen in an Ohio park or preserve. 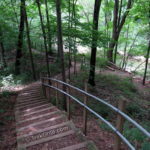 The staircase leading down into Hell Hollow still edges it out for first place. 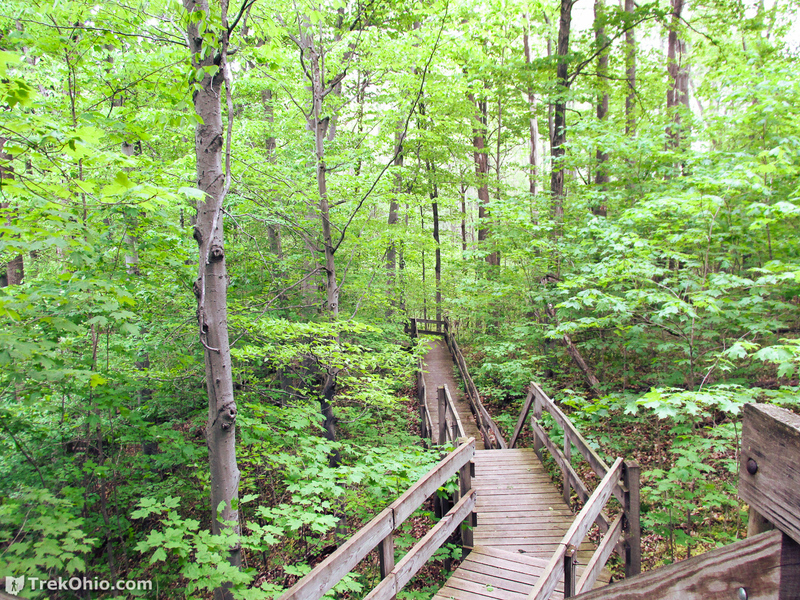 The stairs has level portions that resemble a boardwalk. The stairs just go on and on. 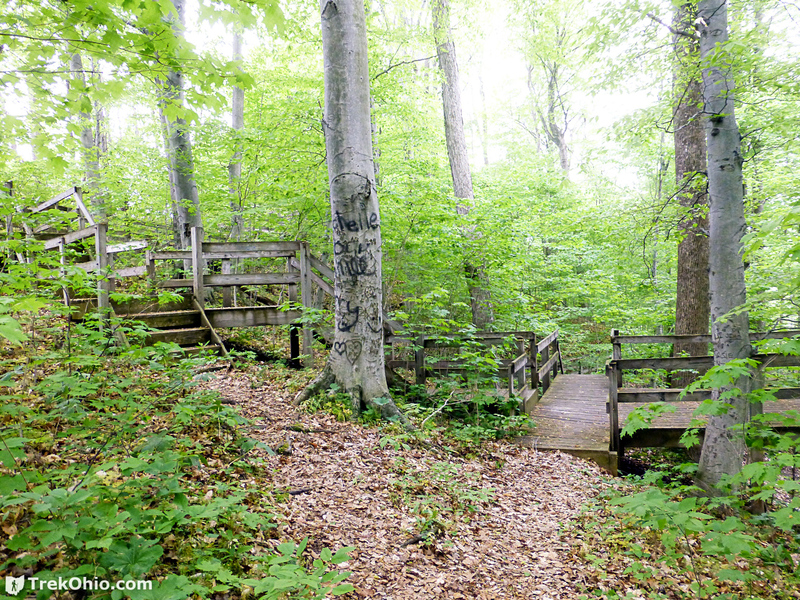 When you get to the base of the stairs you are finally on a dirt path, but beyond this point there are portions of the trail where boardwalks are present. 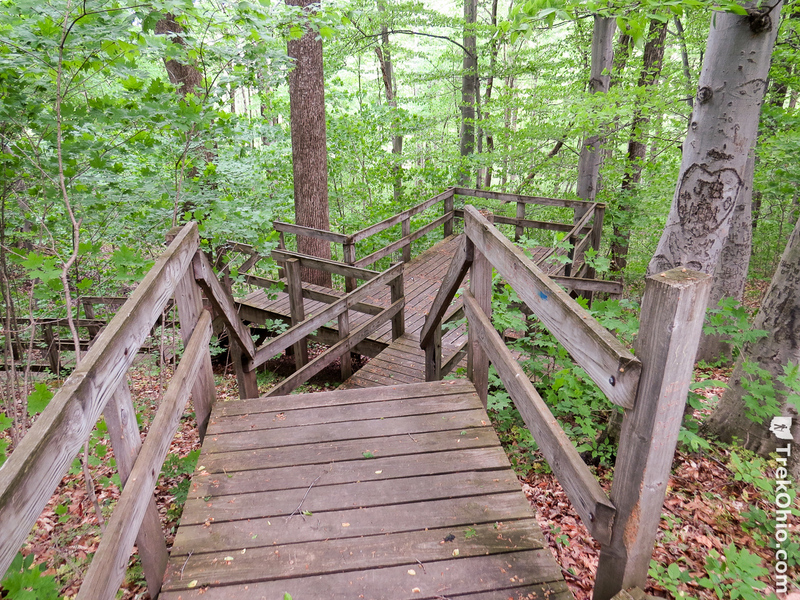 I will note that if you find yourself on wooden stairs or boardwalks after a rain, they can be quite slippery. The trail conditions were excellent with footbridges allowing easy crossings of streams. As I mentioned previously there were a couple points where dirt trails lead to the riverbank of the Sandusky. 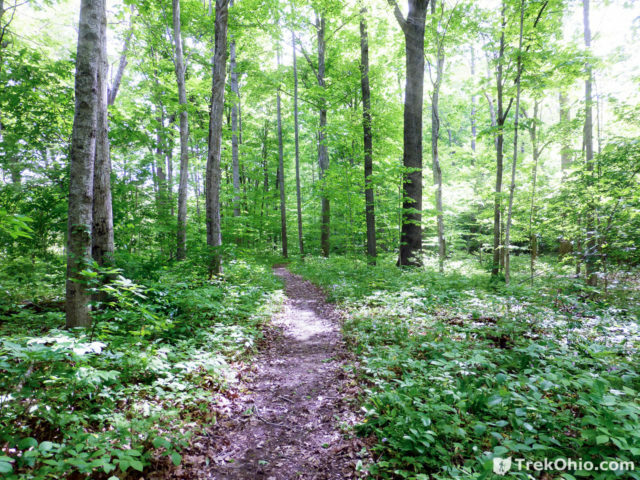 These short trails may have been created by foot traffic as opposed to being an official part of the trail. 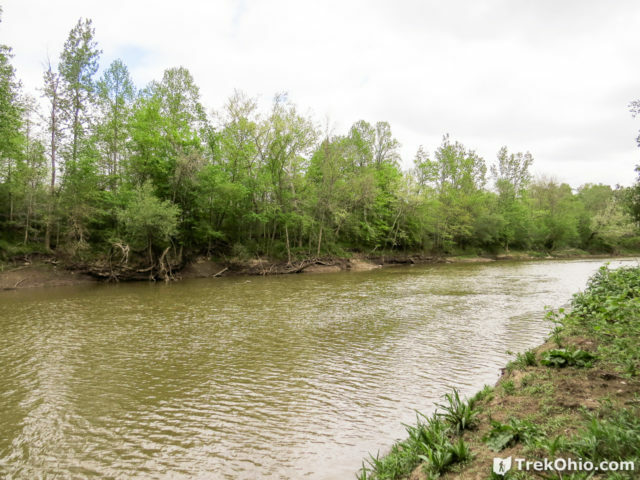 The Sandusky River was the second river to become part of Ohio’s system of designated scenic river systems. 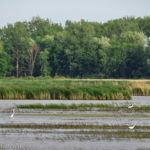 It is the only waterway in the state that is home to every species of Ohio redhorse sucker. 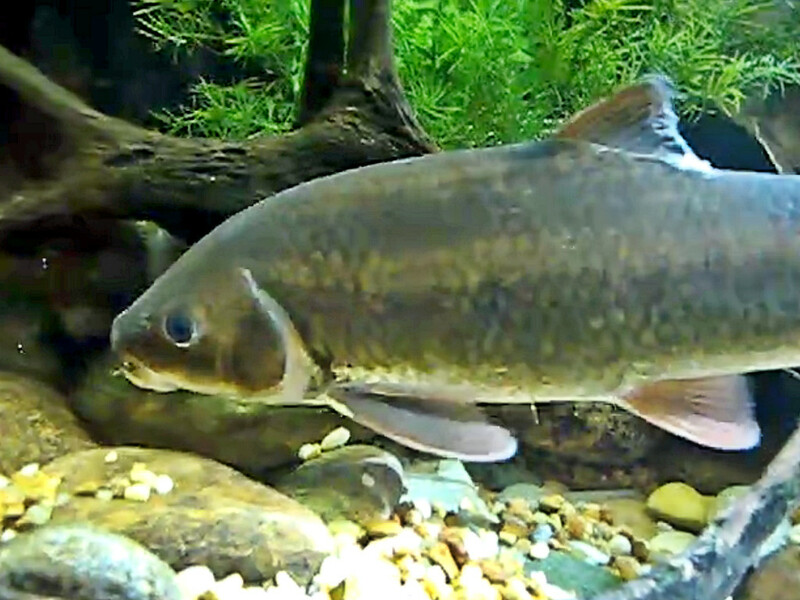 The state-endangered river redhorse (pictured below) is a native, bottom-feeding fish that is only found in healthy rivers. The Sandusky River Valley has a notable history. 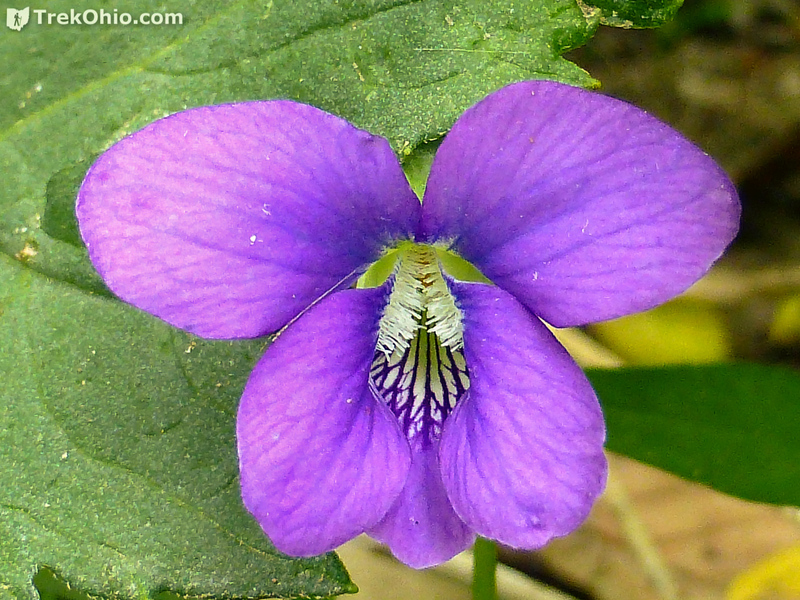 Its riverbanks were once home to the Seneca and Wyandot Indians. After the founding our nation, one of the forts adjacent to the river, Fort Stephenson (formerly known as “Fort Sandusky”), was the scene of a decisive American victory during the War of 1812. On August 2, 1813, 160 Americans defended the fort against 1300 combatants. The British combatants were commanded by Henry Proctor, while the Native American combatants were commanded by Tecumseh, a Shawnee who led a large tribal confederacy. The fort was located where Fremont now is. 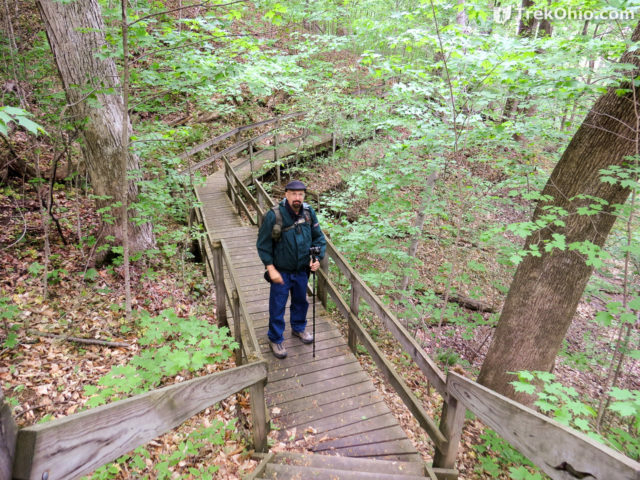 When you reach the northeast portion of the Loop Trail, you have the option of following a side trail that is labeled “Hecks Bridge”, but the trail doesn’t seem to go the whole way to the bridge. 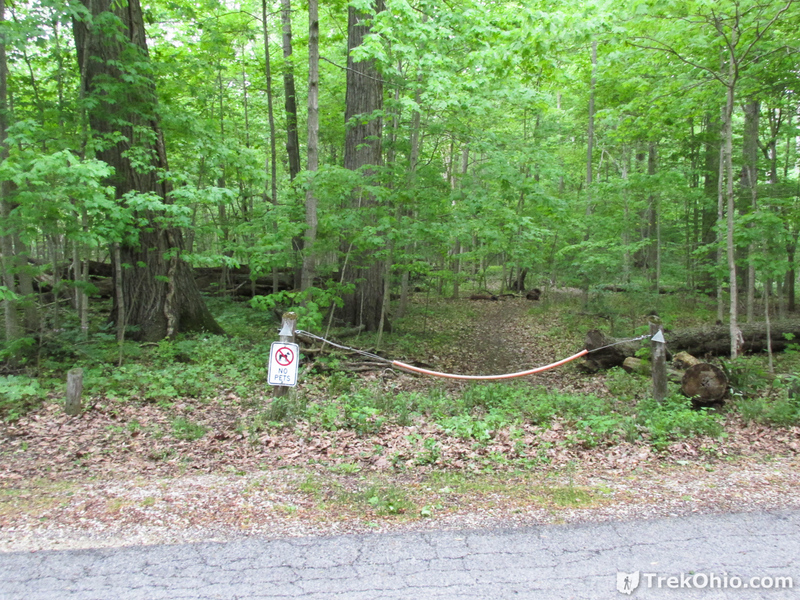 If you follow this trail, you eventually come to a dead-end at S. Township Road 28, so you will have to retrace your steps back to the loop. 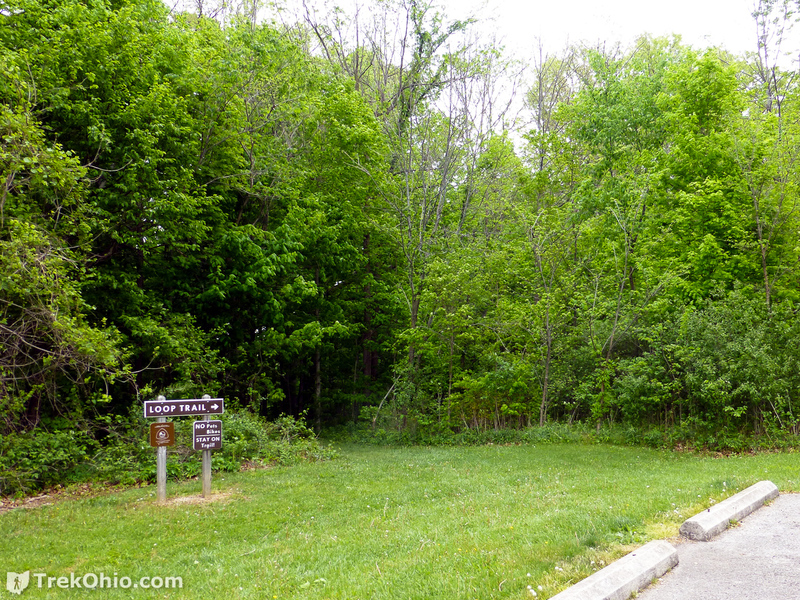 Once we reached S. Township Road 28, we turned around and went back. S. Township Road 28; it crosses the Sandusky River via Heck’s Bridge. On the other hand once I was back home I took a close look at the photo below. 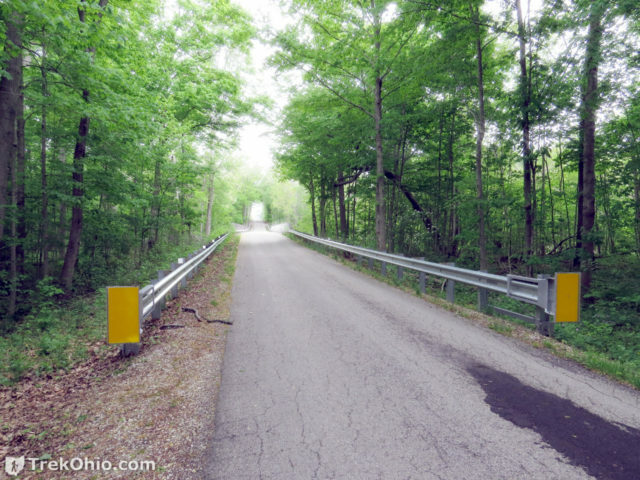 It shows what is beyond the “dead-end” on the other side of S. Township Road 28. While we were hiking there, we interpreted the barrier across the way to mean that visitors were not supposed to continue hiking beyond this point. However, if you look at a larger version of the photo (by clicking on it), you’ll see that there is a sign saying “No Pets.” So perhaps people without pets are allowed to continue on foot beyond this point, and maybe if you do you reach a vantage point where you can see “Heck’s Bridge.” But I just don’t know for certain. Once you’ve retraced your steps back to the loop, you continue on a dirt trail toward the beginning of the loop. 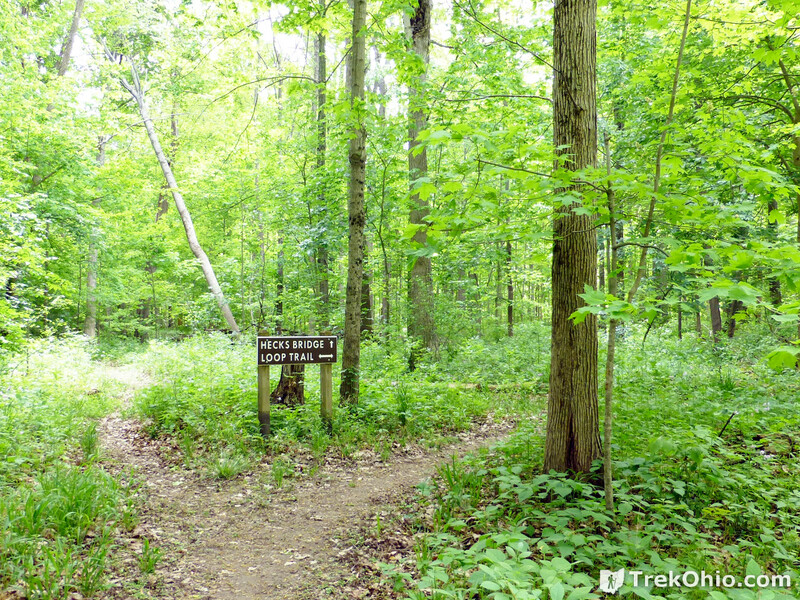 While doing so you will pass the end of the preserve’s driveway. 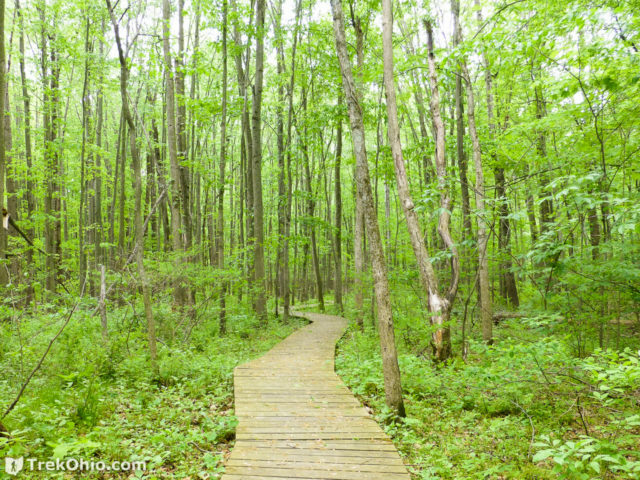 The Loop Trail passes near the cul-de-sac of the preserve’s driveway. And eventually you come back to the wooden stairway, and it is up and out for you. The loop ends back at the stairs. 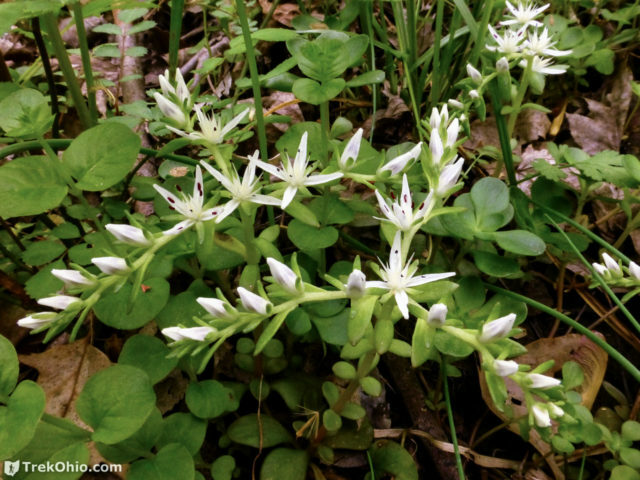 Many species of spring wildflower bloom at Collier State Nature Preserve. We were there on May 12th of a previous year. According to the website (and to the foliage we saw) we were too late to view flowering skunk cabbage, sharp-lobed hepatica, Dutchman’s breeches, squirrel-corn, twinleaf, and marsh marigold. 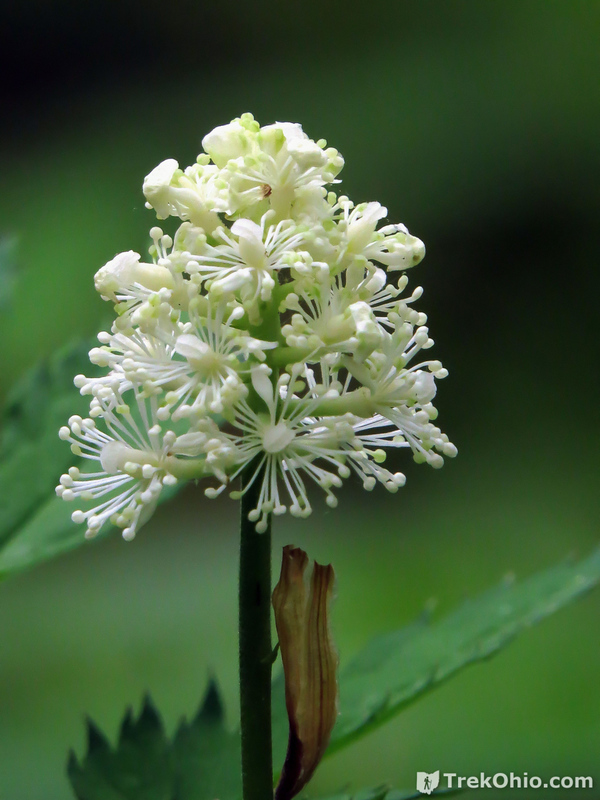 And while we were there we saw some a few species that were still flowering, but which were past their prime, such as Toadshade and Drooping Trillium. 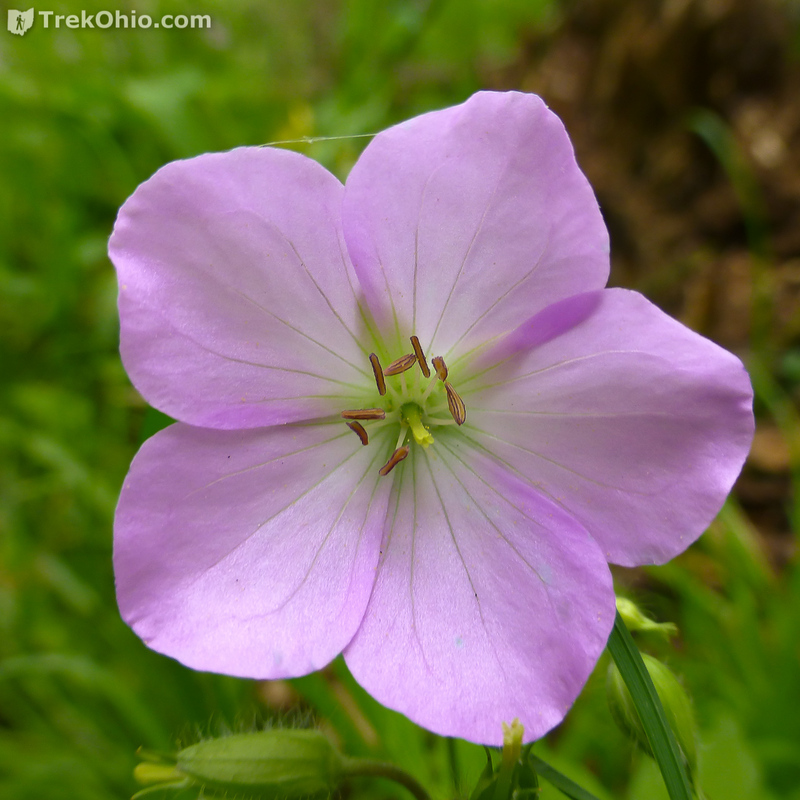 Nonetheless in mid-May were still lots of spring wildflowers in bloom. 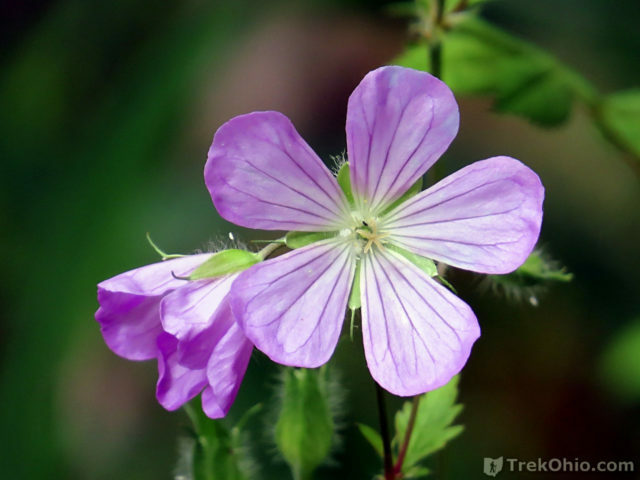 In particular there were large swaths of greenery that were dotted with the blues and lavenders of wild geranium, phlox, and appendaged waterleaf. 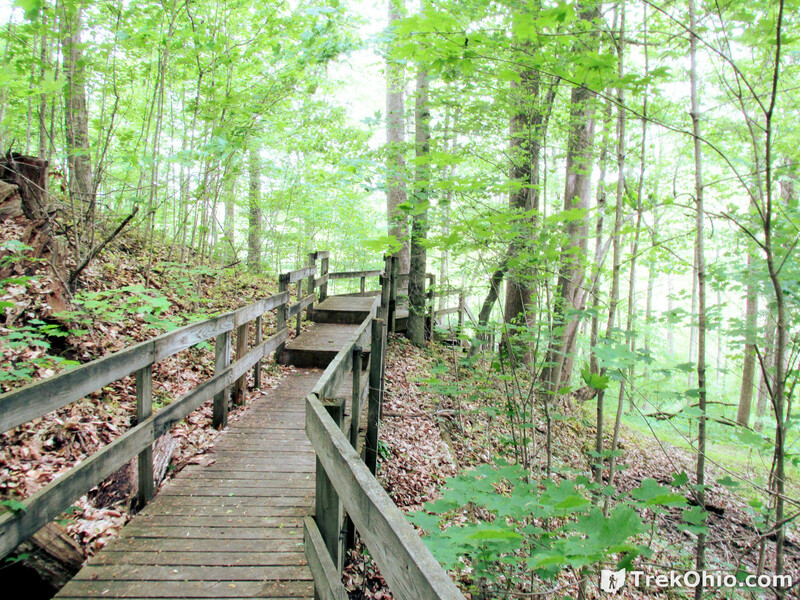 TrekOhio: Seneca County Parks & Nature Preserves— This is the county where Howard Collier State Nature Preview is located; check out this page for links to the official website (listed under Collier) and for information on nearby parks and preserves. Wikipedia: Fort Stephenson — a fort along the Sandusky river that was the site of a decisive American victory over the British and Native Americans during the War of 1812. Wikipedia: Tecumseh — a Shawnee who led a large tribal confederacy against the United States, first during Tecumseh&apos;s War, and later as an ally of the British during the War of 1812. Wikipedia: Tecumseh&apos;s War — preceded the War of 1812, and from a Native American viewpoint, the War of 1812 could be viewed as just a continuation of Tecumseh&apos;s War. Some academic historians consider it to be part of a longer term military struggle for control of the Great Lakes region of North America. Wikipedia: War of 1812 — This war lasted from June 1812 to February 1815. North Americans view it as a war in its own right while the British view it as part of the Napoleonic Wars. Wikipedia: Henry Procter (British Army officer) — A British Major whose forces were allied with the Native Americans against the United States during the War of 1812. 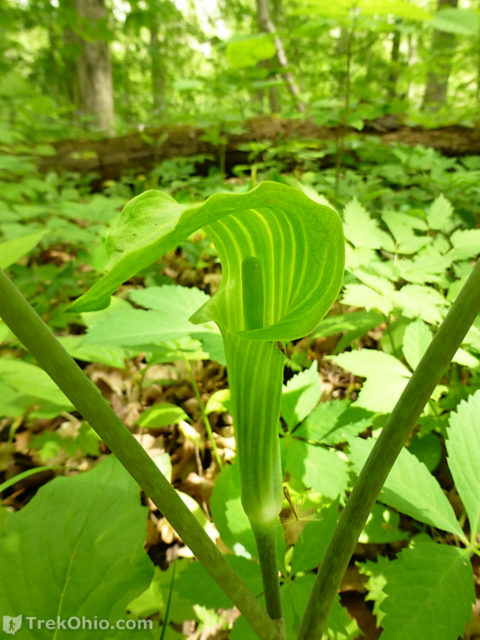 Share the post "Howard Collier State Nature Preserve"
The wooded area across Township Rd 28 was once owned by the park. People would often camp there for the weekend while fishing, boating or just for fun. The park has since sold the property to a private individual and is now off limits to the public. 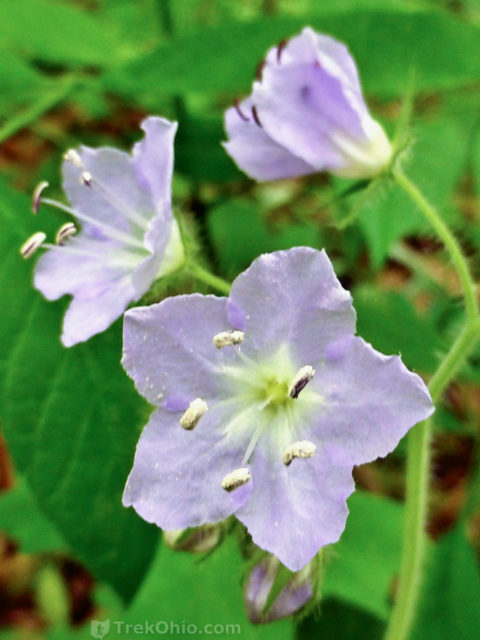 Thanks, PJ, for supplying some information on former boundaries of Howard Collier State Nature preserve.